The school bus routes for the Oxford Schools are listed under the school that your student will be attending. You can find bus routes here. Parents should check the Oxford Public Schools website for information about early dismissal days (for example: conferences and early release days). NOTE: Bus schedules are subject to revisions that result from enrollment changes, transfers and address changes. Changes and / or additions will be posted to the school district’s website and residents are encouraged to frequently check the Oxford Public Schools website. Please do not worry if a bus is late, especially at the start of a school year when it typically takes a few days for kindergarten children and new students to become accustomed to the bus routes and schedules. If, however, you have concerns about your bus being consistently late over a period of several days, please contact the Oxford office at 203-888-2128. Oxford High School – 9:18 a.m.
Great Oak Middle School – 9:58 a.m.
Oxford Center School – 11:00 a.m.
Quaker Farms School – 11:00 a.m.
Oxford High School – 11:30 p.m.
Great Oak Middle School – 12:43 p.m.
Oxford Center School – 1:30 p.m.
Quaker Farms School – 1:30 p.m. The buses traveling out of Oxford run on Oxford’s schedule. Weather conditions in Connecticut may vary dramatically from town to town. All-Star Transportation will ensure safe transportation for all students. The following lists possible scenarios of inclement weather. Oxford: 2-Hour Delay. Out of District: No Delay. Buses will run on a 2-hour delay. Oxford: 2-Hour Delay. Out of District: 90-Minute Delay. Oxford: No Delay. Out of District: 90-Minute Delay. Buses will run with no delay. Oxford: Closed. Out of District: No Delay or 90-Minute Delay. Buses will not run. Sacred Heart/Notre Dame on a 2-hour delay. Oxford: Early Dismissal. Out of District: Not Early. Buses will run on an early dismissal schedule. Information regarding delays/closings/early dismissals for Oxford School District can be received by text messages. You can learn about the service here. To participate and receive SMS text alerts on your cell phone, just text Y, YES, or OPTIN to 67587. Should weather and road conditions prompt the superintendent to close or delay Oxford schools, all buses scheduled for out of district schools will follow the established schedule for that particular day (2-hour delay or no transportation). The superintendent’s decision is made with the safety of students in mind, and bus company will abide by the call. In the morning, Emmet O’Brien students are picked up at their designated stops and transported to Oxford Center School where they transfer to Oxford Bus 15 to Emmet O’Brien Tech. Oxford Bus 15 will depart Center School at approximately 6:35 a.m. In the afternoon, Emmet O’Brien students ride home on Oxford Bus 15 to Center School, where they transfer to a bus that will take them to their designated stops. Please call All-Star at 203-888-2128 with questions. In the morning, Nonnewaug students are picked up at their designated stops and transported to Oxford Center School where they transfer to an Oxford Bus 16 to Nonnewaug. Oxford Bus 16 will depart Center School at approximately 6:35 a.m. In the afternoon, Nonnewaug students ride home on Oxford Bus 16 to Center School, where they transfer to a bus that will take them to their designated stops. On days when Oxford Public Schools are closed due to inclement weather, Nonnewaug students are required to find their own ride to and from school. No buses will be provided. In the morning, Platt students are picked up at their designated stops by shuttle bus and transported to Oxford Center School where they transfer to Oxford Bus 17 to Seymour Community Center and transfer to a bus from All-Star’s Seymour terminal to Platt. Oxford Bus 17 will depart Oxford Center School at approximately 6:35 a.m. In the afternoon, Emmet O’Brien students ride home on an Oxford Bus. Please call All-Star’s Oxford office at 203-888-2128 with questions. 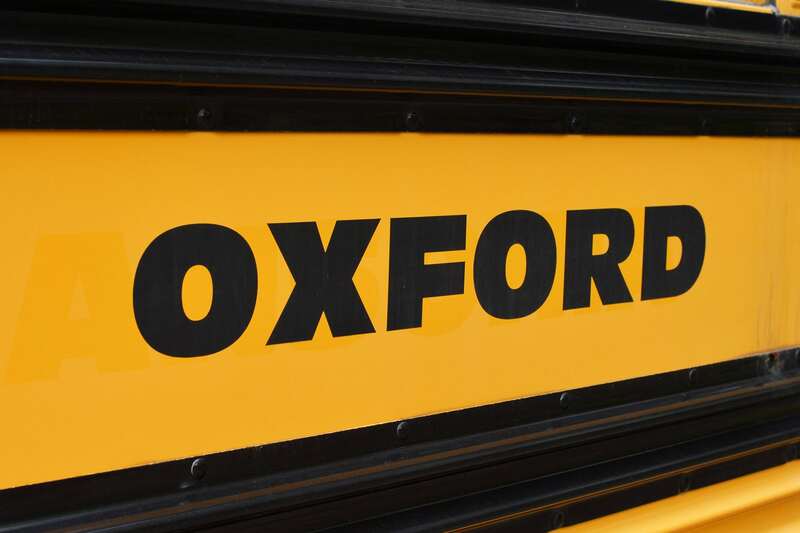 In the morning, Sound School students are picked up at designated stops and ride a shuttle bus to Oxford Center School where they transfer to Oxford Bus 17 to Sound School. Oxford Bus 17 departs Oxford Center School at approximately 6:35 a.m. In the afternoon, Sound School students ride on Oxford Bus 17 and are dropped off at designated stops. All Pre-K and Kindergarten students will be dropped-off at their assigned bus stops and must be met by a parent or an authorized adult / caregiver, or they will be returned to Quaker Farms School. 1. Students should be at their bus stop 5 minutes prior to their scheduled pickup time. If you have any questions, please contact All-Star Transportation’s Oxford office at 203-888-2128 or email [email protected].